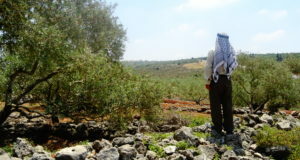 On 30th May 2008 residents of the village of Deir Istiyia in the Salfit region, as well as Israeli and international activists, attempted to plant 50 olive trees in the Palestinian-owned land where the illegal Israeli settlement of Revava is attempting to expand its borders. The illegal settlement began construction last week, illegally and without any consultation. 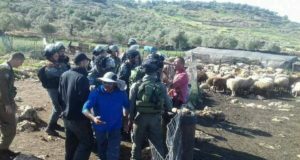 Villagers were able to temporarily halt the construction work on Monday 26th May by confronting the construction workers and Israeli settlers, who were subsequently ordered by the Israeli police to stop work or face a fine of up to one thousand shekels. Construction has since continued, and while villagers are currently fighting the expansion through the Israeli District Coordination Office – proving ownership of the land through maps and title deeds – they are also attempting to prevent the work from taking place while this is in process. At 11am approximately fifteen activists, including the farmers who own the land, residents of the village, Rabbis for Human Rights, Anarchists Against the Wall and internationals, attempted to enter the disputed lands in order to plant the trees that were donated by Rabbis for Human Rights. 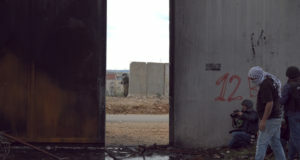 Israeli soldiers quickly appeared and declared the area a “Closed Military Zone”, with documents highlighting the entire area, including the road adjacent to the disputed lands. Soldiers then threatened to arrest the activists if they did not immediately vacate the area – detaining one Israeli for attempting to carry an olive tree with him as he left, after soldiers had threatened to destroy the trees. The truck driver who delivered the trees was also fined 250 shekels for parking on the roadside. He was then threatened with another one-thousand shekel fine if he did not remove the trees from the area and take them back with him. Fifteen more activists arrived, including the mayor of Deir Istiyia, Jamal Abu Fares, but were quickly forced from the area under threat of arrest. At least ten men from the village were forced to walk more than 40 minutes back to the village, as Israeli soldiers refused to let them return by the road. Three hours later, Israeli jeeps entered the village of Deir Istiyia, and harassed the local, Israeli and international activists who were still present there. The residents have vowed to continue fighting against the illegal settlement expansion with further actions to stop the construction work from taking place, as well as by pursuing legal avenues.